Update March 2017: Be aware that while this promotion has been maintained for 2017, most of the packages have been reduced a little. For example, the base Seven Stars no longer has a $100/day folio credit. This year Total Rewards has offered its members a fantastic promotion with the amazing Atlantis Resort in the Bahamas. I would recommend everyone who is able to take advantage of this to absolutely do it as rates at Atlantis are normally very steep. For example, the Cove was listed on Priceline at $500/night for 4 nights in February. You must book your vacation by January 31 and travel by the end of February. That is a great opportunity to get away from winter for a while! Included in the package for Aspiration I. Are you waiting on a higher TR level? The first consideration is what Total Rewards level you will be at the end of the year. The higher the level, the better the package. However, you do not have to wait to book your vacation. If you’d like to travel in early January but don’t expect to make Seven Stars or Diamond Aspiration II until Christmas, Atlantis will book you at the lower package and then you can change the booking to the higher level when you reach it. Atlantis receives the TR database weekly. 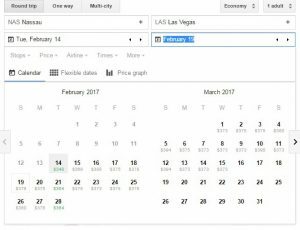 Google Flights easy to use interface allows easy searching for flights. Flight prices to Nassau are fairly consistent, but I found it best to take my vacation based on the flight. My first choice was not available at Atlantis though, so definitely find the flight, then make the reservation, then book the flight. Unfortunately, the Bahamas levies a $100 tax on flights leaving so ultra-low fares are hard to find. I like using Google Flights. From Las Vegas, JetBlue was the best choice. Take the Red Eye! With only four nights at Atlantis, it’s best to take the Red Eye and add a 5th night to the start of your vacation. This will put you in the Bahamas in the morning on your arrival date instead of the evening, giving you time to nap and enjoy an extra night! Jetblue’s Red Eye was the best option for Las Vegas in February. Just how free is it? If you are fortunate enough to be Seven Stars, you could get away with a very cheap vacation as taxes and gratuities are included in the package. They even give you $100/day in credit and a $250 gaming voucher. If you eat on that $100 and only play the free play, you could make a nice dent in your air fare and take the whole trip for $200 or so. Otherwise, you should expect to pay $200 or more in taxes and room fees for the other packages. When making the reservation, be sure to inquire about these costs. All packages except Platinum include the Resort fee fortunately. Atlantis reservations was very helpful and answered all my questions concerning this promotion. Call 800-752-9711. Diamond Aspiration II: How I got $2452 in value from my last one! Total Rewards / Seven Stars for 2018 – What a bummer! When someone asks me how to learn online poker... here ya go.